For those tracking Jawmaggeddon (how I am referring to my extra tooth extraction), the big surgery was yesterday; thus this early Wednesday post. I hope to be back to my regular reviewing and foodie blogging self tomorrow, or Thursday at the latest. In the mean time my jaw is swollen to the size of a modest Grapefruit and I find myself laughing at the term 'pain maintenance meds.' (What a joke for me) In any case, I thought I'd bring you all up to speed on the calamity of a week we've had in the past 7 days. It began with my recovery from a rather persistent chest cold. 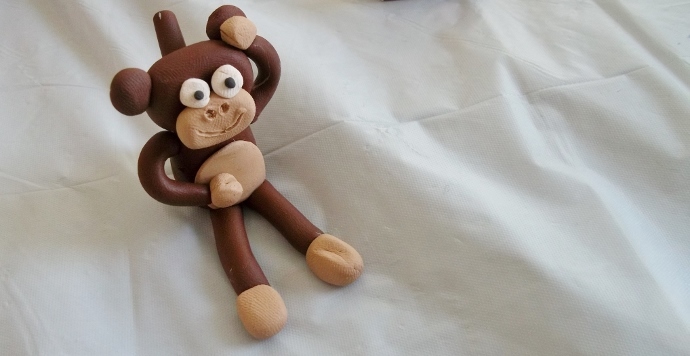 Knowing I'd planned a surprise party for Jay on Saturday (seeing as I was to spend his birthday in oral surgery), I began working on the marzipan characters for his cake. 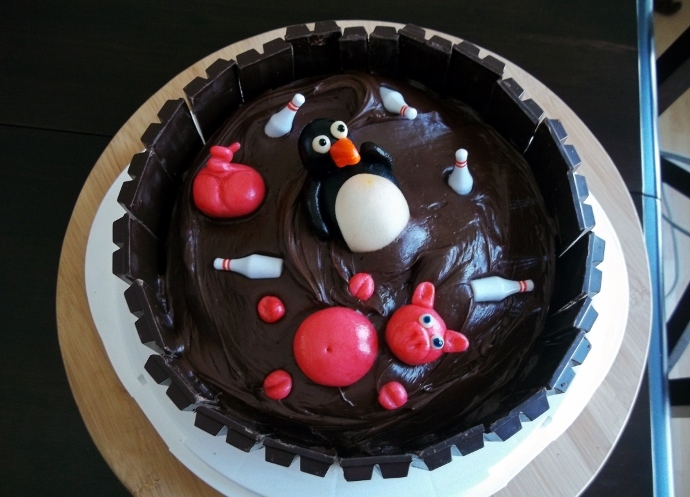 Seen above the 2 pigs swimming in 'mud' with my handcrafted penguin (representative of Jay), amid scattered bowling pins. 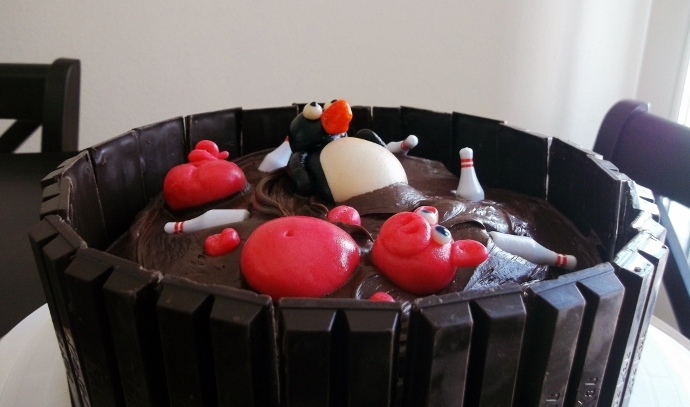 The cake itself is Devil's Food, while the outer 'pigpen' is made of Dark Chocolate Kit Kats, and the 'mud' comprised of Dark Chocolate Frosting. It was quite rich to say the least.There are various other versions of this concept out there, but I'm fairly pleased with how mine turned out. On Wednesday of last week there was a bit of monkey business with my bank account. I received an email from PayPal informing me that my Business Mastercard transaction for $903, in North Carolina, did not go through. An hour later a smaller $9 charge posted to my account from a phone authorization to Kmart/Sears. I had been hoping I could avoid canceling the card until my dentist payment came out the following day, but it was clear something had to be done much sooner. Thankfully the people at PayPal are amazing, and much quicker with these circumstances than my physical bank. They were happy to expedite a new card and refund the fraudulent transactions in less than 5 minutes on the phone! Saturday, the day of the big surprise party, we awoke to discover the power had been out since 4AM. In addition to the lovely background noise of our 'vacation home' neighbor's alarm below us, I was a bit worried about the meticulously crafted cake and refrigerated goods. Southern California Edison remained confident, every 4 hours, the power would be restored in....4 hours. At hour 10, I transferred our fridge contents to my father's house on the way to pick up Jay's mother and brother for the surprise party. As it turned out this was a smart move, for the power did not resume until 17 hours after the initial outage. 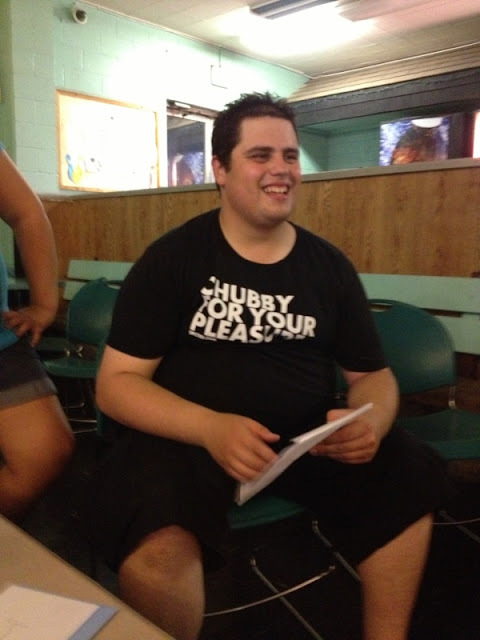 Luckily the party was a hit, and a genuine surprise. 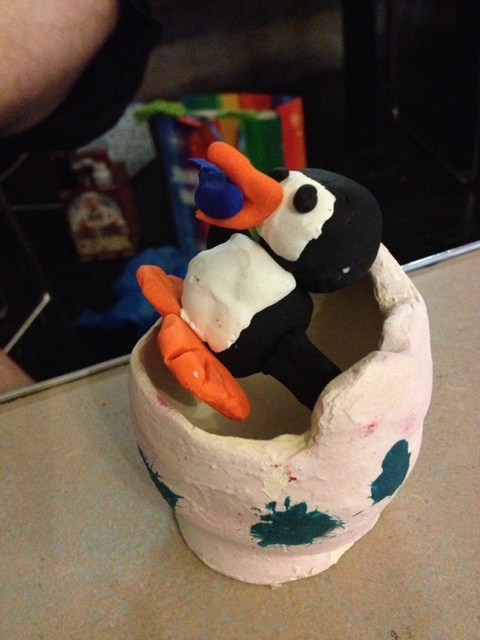 Above you'll see the polymer clay penguin and 'egg' holder Sabrina had made for Jay during Spring break. (There is a fish in his mouth.) Shortly after returning home Jay 'misplaced' his wallet, which has not resurfaced since. On Monday, Jay's actual birthday, I awoke to a notification my oral surgery would be delayed a half hour. It turns out I did not get into surgery until 3 hours after my initial appointment, but it is what it is. 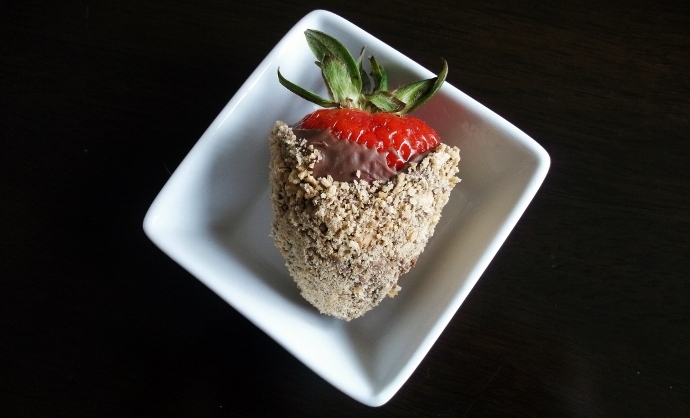 In any case, there were some leftover strawberries and graham crackers from our Hobmother trap, so I made him some chocolate dipped berries in lieu of a cake. Outside of surgery I have remained fairly resilient to the aid of any pain management meds, and my antibiotics have kept my appetite away since. I remain confident each hour will prove me feeling better- and let's hope so, because there are lots of wonderful things here I'm excited to share! What Daughter Says: Despite the bumps along the way, this week, smiles were shared by all. Oh the cake was the absolute sweetest. I hope you recover fast girl! haha that cake is too cute! Hope you're feeling better. I really like the cake design; very cute!